Ecosystems are a community or communities of species living together as a functional unit in a specific physical environment. In an area such as the Great Barrier Reef, there are different types of ecosystems (e.g. coastal, estuarine and marine). Each ecosystem is unique based on the organisms that live within it and their non-living surroundings. 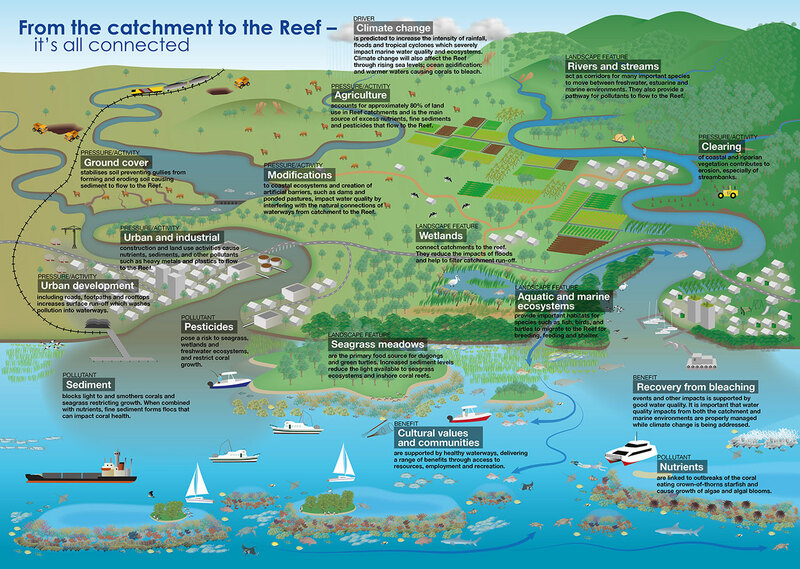 Inshore, coastal and adjacent catchment ecosystems that connect the land and sea have the potential to influence the health and resilience of the Great Barrier Reef. Poor water quality associated with run-off from the adjacent catchments and increased flooding is a major cause of the current poor state of many of the key ecosystems of the Great Barrier Reef. Wetlands is a broad term to describe natural or artificial areas where water covers the soil for all or part of the year and the mainly aquatic plants have adapted to these conditions. The water can be salty or fresh, static or flowing, and each wetland is a unique ecosystem. Wetlands include swamps, marshes, billabongs, lakes, saltmarshes, mudflats, mangroves, coral reefs, fens and peat bogs. There are around 13,000 wetlands in catchment areas linked to the Great Barrier Reef. They play an important role in the life cycle of many Reef fishes and other marine and bird life, filter out pollutants before they reach the ocean and connect ecosystems. The 2025 target in the Reef 2050 Water Quality Improvement Plan is no loss of the extent of natural wetlands. Gullies are the most visible form of soil erosion. These range from single to multiple channel systems, usually greater than 30cm deep, which are created by run-off. Gully erosion mostly occurs on cleared land and can result in significant loss of soil. Soil from gullies is a major component of sediment in Great Barrier Reef catchment run-off and can end up as a pollutant in riparian, coastal and Reef ecosystems. Retaining or restoring ground cover helps to stabilise soil and prevents gullies from forming. The 2025 target in the Reef 2050 Water Quality Improvement Plan is 90% of grazing land will have greater than 70% ground cover in the late dry season. Rivers are the main source of freshwater flowing across the Great Barrier Reef catchment into the sea. Their size and associated pollutant load increases significantly during the wet season, when flooding is common, and when they are modified. Water quality monitoring takes place in many rivers to measure nutrient, sediment and pesticides in run-off that flows from the land to the Great Barrier Reef. Often the river water looks clean and clear but can be carrying large amounts of pollutants. Rivers act as corridors for many important species to move between freshwater, estuarine and marine environments. Riparian refers to items related to or situated on the bed and banks of a river or watercourse. For example, riparian vegetation refers to plants growing in or near a river, creek or water body. Large riparian areas have been removed or degraded throughout the Great Barrier Reef catchments through clearing for cropping and livestock grazing and to provide animals with access to water. This results in significantly increased erosion and loss of fine sediment to the Reef. The 2025 target in the Reef 2050 Water Quality Improvement Plan is to increase the extent of riparian vegetation. Mangroves are flowering plants that grow along estuaries, rivers, bays and islands providing coastal protection and supporting key Reef ecosystems. Mangrove communities are usually groups of small trees and shrubs, growing in sheltered areas where fine sediments accumulate. Their roots are submerged by seawater during the daily tidal cycle. Saltmarshes tend to grow on the landward side of mangroves where saltwater inundation occurs less frequently (usually only during high spring tides). These communities consist of salt tolerant, flowering plants such as low growing shrubs, herbs and grasses. Mangroves and saltmarshes are ecologically important habitats that link the land and marine environments and form a critical part of the Great Barrier Reef ecosystem. Excess nutrient and sediment loads and pesticide concentrations affect mangroves, especially during periods of high rainfall. The Great Barrier Reef includes the world's largest coral reef ecosystem with some 3000 coral reefs. Corals are marine invertebrates that are part of the same group as jellyfish and sea anemones. Corals are colonial animals (or polyps), where many coral polyps group together to form a coral colony. There are two main types of corals—hard and soft. Soft corals are flexible because they lack a solid skeleton. Hard corals produce a limestone skeleton to support themselves. These coral skeletons are the building blocks of a coral reef, where many coral colonies grow together to form the reef structure that supports a wide range of organisms. Most corals have a mutually beneficial relationship with a specific type of microalgae called zooxanthellae that live within the coral’s tissue. Through photosynthesis, the microalgae provide the coral animal with nutrients and are critical for their survival. Coral reefs are sensitive to disturbances such as cyclones, high water temperatures, increasing ocean acidification, major floods and coral-eating crown-of-thorns starfish outbreaks. Seagrasses are plants found in bays, estuaries and coastal waters. They differ from seaweed in that they have roots, stems, leaves, and produce flowers, fruits and seeds – similar to plants on land. Seagrasses grow in shallow waters where they can capture sunlight for photosynthesis. They provide shelter and food for animals, fish, marine mammals and birds, as well as play an important role in nutrient cycling and stabilising sediment on the sea floor. Increased sediment levels reduce the light available to seagrass ecosystems and inshore coral reefs. This can stunt their growth, and even smother them, if present for extended periods. Excess nutrients can favour the growth of plankton and algae which reduces the light available to seagrass leaves and eventually leads to algae dominating seagrass meadows.